I was asked if I would like to create a page for this web site and jumped at the chance to reach a wider audience. 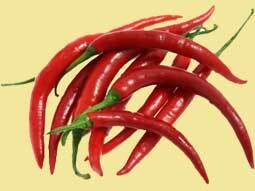 I hope the following information will encourage you to use chillies in your cooking and for those of you who are already chilli lovers some new ideas. It is widely thought that chillies originate from an area in south America, today's thinking would put it somewhere in an area bordered by that of brazil, Bolivia, Paraguay and Argentina. This area is known as the nuclear area and would have contained the greatest concentration of wild species in the world. 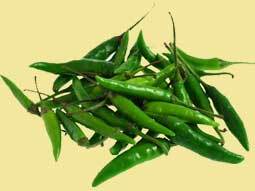 Scientists believe that from this nuclear area birds were the primary carrier for the spread of chillies. Peppers are starting to get the recognition that they deserve for being amongst the most interesting a versatile plants grown. The pods grow in many different shapes, colours and pungency. Extracts from the pods are used in cosmetics, medicine, and law enforcement and of course in cooking where they have unlimited uses such as jams, jellies, oils, vinegars, relishes, chutneys, mustards, butters, stews, salsa and sauces and too many dishes to name. There are also many ways of storing chillies such as freezing, pickling, drying, smoked and powdered. When using chillies in cooking there are so many different varieties all with different tastes and strengths, for first timers or those just starting out the two ways of reducing the heat of a chilli, are removing all the seeds and the white or orange membrane that they are attached to. It is often said that the heat comes from the seeds, but this membrane is the hottest part of a chilli. Then as you get more adventurous leave in the seeds and membrane. Chillies are so versatile that I find they can be used in so many different recipes. I like to experiment and try them in all sorts of recipes. Two of my favourites would have to be chilli ice-cream (recipe below) and chilli cheese bread. Growing my own chillies I always have a ready supply for my experiments. Place mixture into any ice-cream maker and you will be enjoying it about 30 minutes later!!! This special feature page on chillis was provided by Simon 'Crazychef' Howlett.